Historians generally agree that there are 5 main categories of Moroccan carpets: Middle Atlas carpets (very "ethnic"), the High Atlas (often yellow and bright, knotted lambswool), Rabat, Morocco, and the Eastern Atlantic plains. The Eastern Atlantic plains, represented by the Haouz of Marrakech and Chiadma coastal tribe carpets, is perhaps the most suprising. 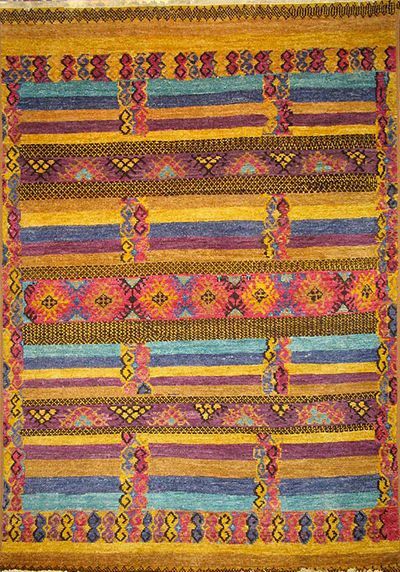 It is characterized by a lack of structure: the motifs are irregular, the layout is deliberately confusing, and the wool is uneven. These are mysterious carpets that seem to draw from a primitive source. In Tunisia, the most well known carpets are the Zerbiya from Kariouan (knotted) and the Bedouin (thick/long-pile) called qtifa, which are rare enough that we can further subdivide them into 3 subgroups: carpets from Drid, carpets from Ouled Bou Ghanhem, and carpets from Hamama, Mahadba, or Jlas. In these mountainous and rural regions, sheeps wool is used to knot carpets but also to weave blankets, make the fabric for tents, robes, shawls, and djellabas. The Middle Atlas carpets are carpets with a thick/long pile (bilo) . The way we position the carpet corrosponds to the smooth side of the fabric (taghessa). The most productive tribes are the Zaiane, the Beni Ouarain, and the Beni Mguild. 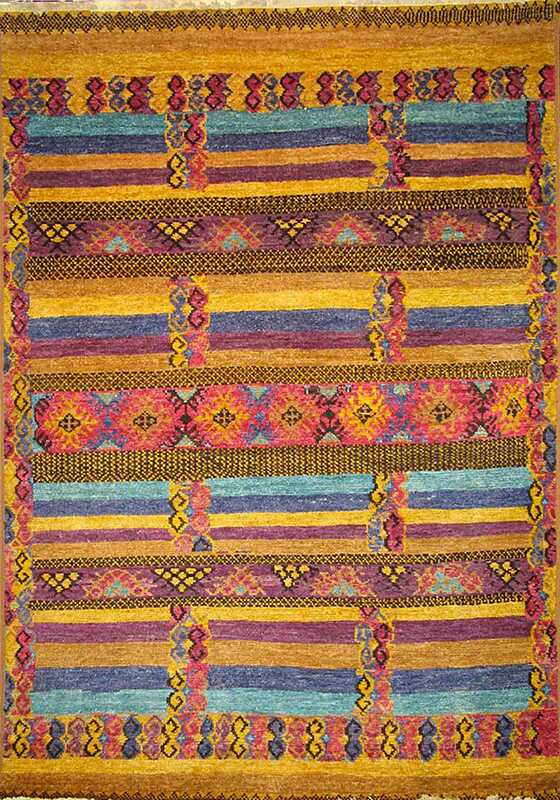 These tribes make three types of carpets: the ichdif (carpet with white background with colored diamonds), the tazerbit (carpet with a colorful background), and the aberachno (white carpet devoid of any motif). 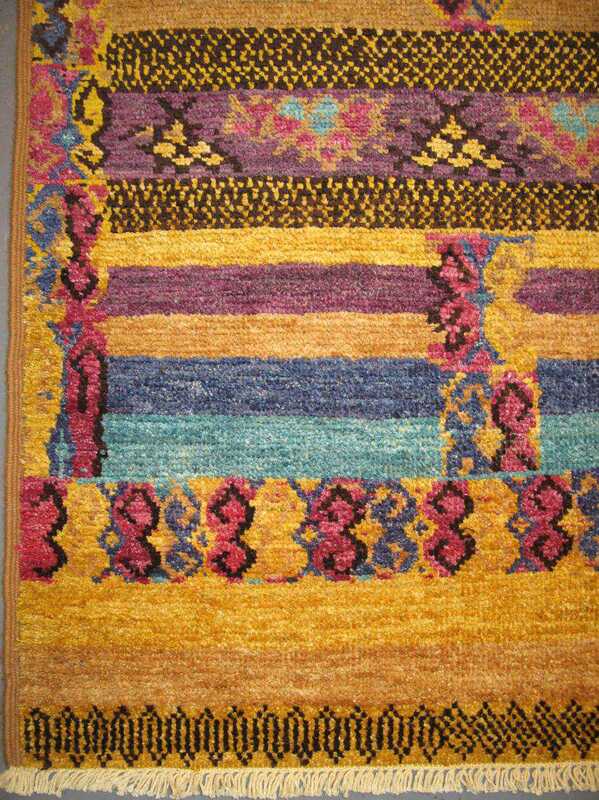 Some Berber carpets combine two techniques- knotting and weaving - and use 2 types of wool: sheep wool for the actual carpet, and goat or camel wool for the fringes. In general, the carpets are made by women. 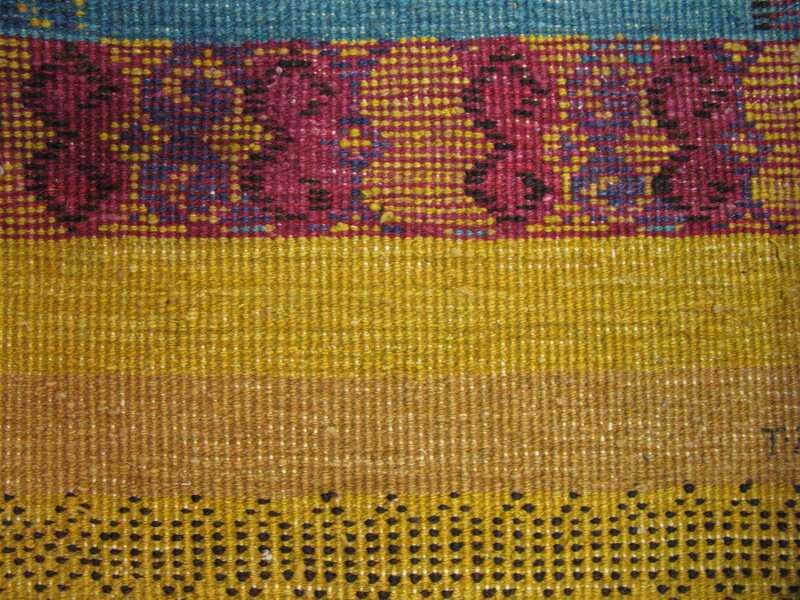 The carpets made by the Ait Ighezrane tribe are knotted in a 4 thread-line sequence . Red is the dominant color of the Middle Atlas carpets today but in the past each tribe had its own favorite color(s): Ait Yacoub liked black, snow white for Beni Ourain, brown, cream and blue for Marmoucha, Beni Mcguild liked yellow, and Mrirt willingly juxtaposed bright colors like orange and green. In order to make these colors the tribes used many natural dying products: madder roots for garnet, dried and pounded apricots for scarlet, black smoke and iron sulfate for black, pomegranate tree bark for yellow. Around 1920 , Prosper Ricard took note of the Benni Mcguild recipe for dyeing brown garnet "Take taroubia root (madder) or dried tazra root if unavailable; crushed with the asemmoum (wild green grapes) or the asemmoum. Place this mixture in a container of water with the threads to dye them and leave them there overnight. The next morning boil the mixture for 2 or 3 hours; remove the the threads and leave them to dry. Dissolve oak ashes in the water, dip the wool threads in the bath, leave them there for an hour; remove and rinse well under running water." The patterns on these types of carpets are mostly geometrical and angular -- never do we find rounded, curved or central motifs. The field of a Berber carpet primarily contains diamonds, triangles, and chevrons arranged in checkerboard or horizontal stripes. Very large Beni Alaham carpets -- some measuring upwards of 7 X 2 meters - contain a succession of small white diamonds sperated by a maze of black points. These diamonds could symbolize tents. Other figurative motifs are traditionally interpreted as full lips, amulets, slippers, tent pegs, storks, lion claws and jackal feet.